With a consistent rise in data breaches over the years, it is crucial that business owners take their network security serious. Did you know in 2017, there was a 40% increase in data breaches? The last thing an organization wants is for someone to gain access to crucial data, or have access to their internal technology systems which can not only cause data loss, and downtime, but can pose as a legal matter as well. Network Security pertains to measures taken to protect directories, files and other areas of your IT infrastructure to avoid corruption or infection. If you are asking that question, there could be a good chance there are vulnerabilities within your network you are not aware of. There are many steps you can take including hardware, software and general technology use practices to help reduce your risk of a data breach. How can someone breach my network? Depending on what type of protections you have in place, a data breach can take a few days, or a matter of moments. A breach can occur from a complex algorithm placed within your network from a “hacker”, or can come from something as simple as an employee unknowingly opening an infected email. You’ve probably heard terms such as malware, ransomware, and virus, but what about a disgruntled ex-employee? It’s important to have procedures in place to avoid internal data breaches as well. When it comes to network security, having a professional identify, recommend and partner with you to make sure your organization and its data is protected is always a wise idea. One of the first steps we take at INS when you become partners with us, is a network vulnerability review. This will pin point any weak points in your infrastructure, and allows us to make recommendations on how to increase your security level. If you aren’t sure how secure your network is, then you need to schedule your network vulnerability review today by calling (248) 536-5400. For some free tips on network security, you can download our Quick Tips- Network Security guide here. 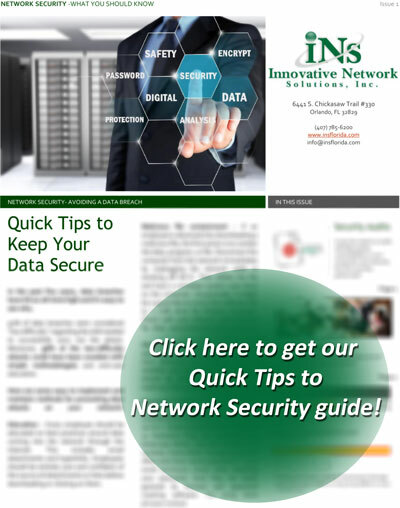 Receive our FREE Quick Tips - Network Security guide! We will not send spam or sell your information.